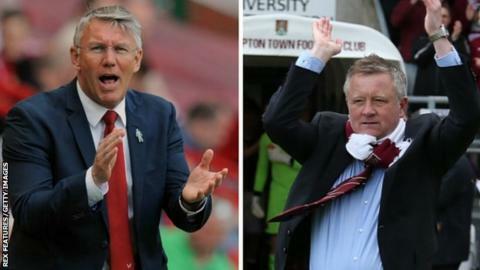 Sheffield United have appointed Northampton boss Chris Wilder as their new manager on a three-year contract. He replaces Nigel Adkins, 51, who was sacked on Thursday after the Blades missed out on the League One play-offs. Wilder, 48, won the League Two title with Northampton this season. "Sheffield United is a very big club for this division and Chris has always been a fan. I think this opportunity was too good for him to turn down," Cobblers chairman Kelvin Thomas said. Ex-Blades defender Wilder will be joined at Bramall Lane by his assistant from Northampton Alan Knill and the club's head of sports science Matt Prestridge. Wilder and Knill had discussions with relegated Championship side Charlton earlier this week before deciding against a move to The Valley. Sheffield United finished in 11th place, eight points off the play-off places, and now face a sixth season in the third tier. After his sacking Adkins tweeted: "I've met many good people in the 11 months I've lived in Sheffield. I wish you well. It saddens me to say goodbye." The former Southampton and Reading boss was appointed in June last year on a three-year contract. He succeeded Nigel Clough, who lost his job following defeat in the 2014-15 League One play-offs, but leaves the Blades after guiding them to their lowest league position since 1983. Wilder initially joined Sheffield United in 1986 and made his Football League debut for the club. He grew up in Sheffield and spoke to BBC Radio Northampton about his support for the Blades in an interview in 2014: "I was fortunate enough to play and captain my hometown team and it is a place that is close to my heart. "I was a ballboy there and I'd go to the game with my pals when I was younger. When I was playing if I was ever out of the team I would go and watch them. "It was incredible to play for them. I always appreciated the support I got from the fans." Only promotion will do at Bramall Lane? Wilder will be the fifth full-time manager charged with leading the Blades to promotion from League One since their relegation from the Championship in 2011. Danny Wilson took over from Micky Adams following relegation and took them to the play-off final in his first season, but they lost to Huddersfield on penalties. He was then sacked in April the following year and caretaker Chris Morgan could only guide them to a play-off semi-final defeat by Yeovil. David Weir was appointed in June 2013, but a disastrous start to the season saw him replaced by Nigel Clough in October of that year. Clough took the Blades to the semi-finals of both the League and FA Cup but could not lead them to promotion, losing to Swindon in last year's play-offs, before being replaced by Adkins. "Given the success Chris Wilder has had with the Cobblers, it was inevitable clubs would be interested. "Bolton and Charlton have both been turned down and there were even rumours of Nottingham Forest being interested today, but there wasn't much chance of Wilder turning down Sheffield United. "Many Cobblers fans won't just remember this wonderful season, but also his impassioned speech at the Notts County game which seemed to spur on the Kelvin Thomas takeover and the securing of the club's future."